Justinian I and ministers wear early Byzantine ceremonial chlamydes, Ravenna mosaic. 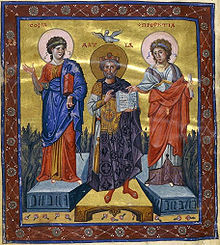 At the basilica of Sant'Apollinare in Classe in Ravenna, the Heraclian Emperor Constantine IV Pogonatus wears a chlamys similar to that of Justinian I, the namesake of his son and successor. 11th-century emperor wears the chlamys, as do three of his officials. ^ Ancient Greek Dress Heilbrunn Timeline of Art History, Metropolitan Museum of Art, 2000–2013. Retrieved 7 October 2013. Justinian II, surnamed the Rhinotmetos or Rhinotmetus, was the last Byzantine Emperor of the Heraclian Dynasty, reigning from 685 to 695 and again from 705 to 711. Justinian II was an ambitious and passionate ruler who was keen to restore the Roman Empire to its former glories, but he responded poorly to any opposition to his will and lacked the finesse of his father, Constantine IV. Consequently, he generated enormous opposition to his reign, resulting in his deposition in 695 in a popular uprising, and he only returned to the throne in 705 with the help of a Bulgar and Slav army. His second reign was even more despotic than the first, and it too saw his eventual overthrow in 711, abandoned by his army who turned on him before killing him. 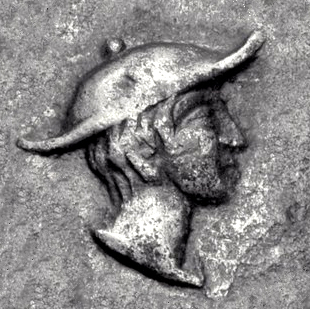 A petasos or petasus is a sun hat of Thessalian origin worn by ancient Greeks, Macedonians, Thracians and Etruscans, often in combination with the chlamys cape. It was usually made of wool felt, leather or straw, with a broad, floppy brim. It was worn primarily by farmers and travellers, and was considered characteristic of rural people. As a winged hat, it became the symbol of Hermes, the Greek mythological messenger god. Byzantine dress changed considerably over the thousand years of the Empire, but was essentially conservative. The Byzantines liked color and pattern, and made and exported very richly patterned cloth, especially Byzantine silk, woven and embroidered for the upper classes, and resist-dyed and printed for the lower. A different border or trimming round the edges was very common, and many single stripes down the body or around the upper arm are seen, often denoting class or rank. Taste for the middle and upper classes followed the latest fashions at the Imperial Court. As in the West during the Middle Ages, clothing was very expensive for the poor, who probably wore the same well-worn clothes nearly all the time; this meant in particular that any costume owned by most women needed to fit throughout the full term of a pregnancy. The Barberini ivory is a Byzantine ivory leaf from an imperial diptych dating from Late Antiquity, now in the Louvre in Paris. It represents the emperor as triumphant victor. It is generally dated from the first half of the 6th century and is attributed to an imperial workshop in Constantinople, while the emperor is usually identified as Justinian, or possibly Anastasius I or Zeno. It is a notable historical document because it is linked to queen Brunhilda of Austrasia. On the back there is a list of names of Frankish kings, all relatives of Brunhilda, indicating the important position of queens within Frankish royal families. Brunhilda ordered the list to be inscribed and offered it to the church as a votive image. Clothing in ancient Greece primarily consisted of the chiton, peplos, himation, and chlamys. Ancient Greek men and women typically wore two pieces of clothing draped about the body: an undergarment and a cloak. Ancient Greek clothing was mainly based on necessity, function, materials, and protection rather than identity. Thus, clothes were quite simple, draped, loose-fitting and free flowing. Customarily, clothing was homemade and cut to various lengths of rectangular linen or wool fabric with minimal cutting or sewing, and secured with ornamental clasps or pins, and a belt, or girdle (zone). Pieces were generally interchangeable between men and women. However, women usually wore their robes to their ankles while men generally wore theirs to their knees depending on the occasion and circumstance. Tiberius was the son of Emperor Justinian II and Theodora of Khazaria. He served as Co-emperor of the Byzantine Empire with his father Justinian II, from 706–711. He was killed in 711, when Bardanes led a rebellion, which marched on Constantinople, killing Justinian as well as Tiberius. After his death, two different individuals impersonated him, with one, named Bashir, going on to be hosted by Hisham ibn Abd al-Malik, the Umayyad Caliph, before his lie was discovered and he was crucified. The loros was a long, narrow and embroidered scarf, which was wrapped around the torso and dropped over the left hand. It was one of the most important and distinctive parts of the most formal and ceremonial type of imperial Byzantine costume, worn only by the Imperial family and a few of the most senior officials. It developed out of the trabea triumphalis of the Roman consuls. There were different male and female versions. Byzantine sources speak of the "loros costume" as the loros dictated the rest of the imperial outfit. The slightly less formal, and more secular, imperial costume, which was also that normally worn by high officials on official occasions, was the chlamys costume. Underneath either the loros or the chlamys were worn the divetesion (διβητήσιον), a long silk robe, and a tunic. The kabbadion was a caftan-like garment, of oriental origin, which became a standard part of court costume in the last centuries of the Byzantine Empire. Greek dress refers to the clothing of the Greek people and citizens of Greece from the antiquity to the modern times. The Romanos Ivory is a carved ivory relief panel from the Byzantine empire measuring 24.6 cm by 15.5 cm and 1.2 cm thick. The panel is currently in the Cabinet des Médailles of Paris. Inscriptions name the figures of the emperor Romanos and his wife Eudokia, who are being blessed by Christ. However, there were two imperial couples by these names and scholars have yet to agree which is shown. It was first believed to represent Romanos IV and therefore dated between 1068 and 1071. Discoveries of other carved relief works in the 20th century led researchers to think that it represents the earlier Romanos II, changing the date of creation to somewhere between 945 and 949. The Trier Adventus Ivory or the Translation of Relics Ivory is an artwork in the Trier Cathedral Treasury in Trier, Germany. The 4th-century relief is a piece of ivory carving from the Byzantine Empire. It was acquired by the Cathedral of Trier in 1844. The work is considered to be an "enigma of Early Byzantine art" and scholars have debated over the ivory's date of manufacture, its original location, and who is depicted. The panel is relatively intact aside from minimal damage to the top right and bottom left corners and some missing figures heads.